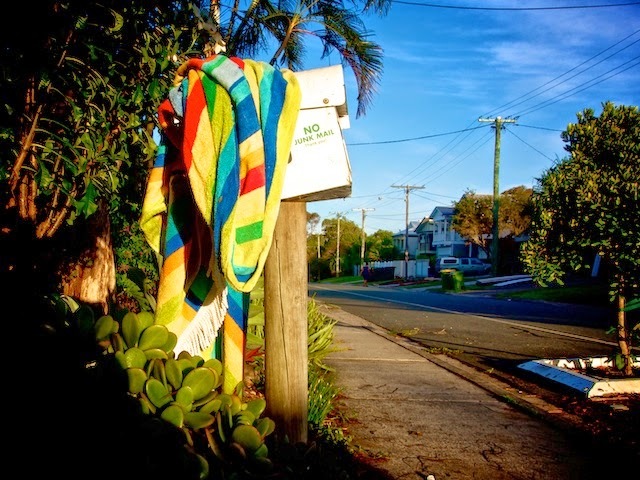 There is no way of knowing if the towel was left on the letterbox by someone on their way home from the beach, by someone who thought it would be a handy place to retrieve it first thing in the morning, or as permanent decoration. Since it was gone this afternoon, I guess it wasn't the latter, but it made for a lovely piece of ad hoc street art in the meantime. A well-dressed man stopped at a trash can yesterday, someone had left a jacket there, he picked it up for a closer look and then promptly walked away with it.